This website is an on-line service provided by CCeXchange, LLC, (hereinafter "CCX") and is subject to your compliance with the following terms and conditions set forth herein and includes any attachments hereto. PLEASE READ THIS DOCUMENT CAREFULLY BEFORE ACCESSING OR USING THESE SERVICES. BY ACCESSING OR USING THIS SITE, YOU AGREE TO BE BOUND BY THE TERMS AND CONDITIONS SET FORTH HEREIN BELOW. IF YOU DO NOT WISH TO BE BOUND BY THESE TERMS AND CONDITIONS, YOU MAY NOT ACCESS OR USE THESE SERVICES. CCX RESERVES THE RIGHT TO MODIFY THIS AGREEMENT AT ANY TIME, AND SUCH MODIFICATIONS SHALL BE EFFECTIVE IMMEDIATELY UPON POSTING THE MODIFIED AGREEMENT. IT IS STRONGLY RECOMMENDED THAT YOU PERIODICALLY RETURN TO THIS PAGE AND REVIEW THIS AGREEMENT FOR SUCH CHANGES AND MODIFICATIONS. YOUR CONTINUED ACCESS AND USE OF THIS SITE AND THE SERVICES OFFERED CONSTITUTES YOUR CONCLUSIVE ACCEPTANCE OF THE MODIFIED AGREEMENT. CCX along with its "affiliates" and "partners" began its operations in 1999. While incorporating a very diverse business platform and offering a wide variety of Internet business applications, the Terms and Conditions of the services and products offered herein by CCX will pertain to all business transactions originating from or conducted on this website. Please find below documentation governing the operating policies of these companies. CCX has agreed to link to other associated websites and although this proves beneficial to both parties, when you access these links, you actually exit the CCX site and are no longer protected under this agreement. Any information found or provided by this website including, but not limited to, the legal documents, products, software, screens, graphics, text elements, or other related services displayed during normal operations is the expressed property of CCX and/or its third party affiliates, providers, developers, or authors. Except as provided herein, none of the aforementioned materials may be copied, distributed, published, displayed, used to create derivative work from, or sell any information obtained from this website without expressed written consent by CCX, the affiliates or partners. CCX and the CCX Logo, as well as all other logos published and displayed within this website and our links remains the trademarks of their respective owners. When accessing certain areas of the CCX site or utilizing services originating from the site we may ask that you provide privileged or sometimes sensitive information about yourself that would enable us to process your request. Whatever the circumstances may be, any information provided to CCX will be handled in a confidential manner. This information will only be used for its intended purpose and will not be shared with anyone without our client's expressed permission. CCX will make a good faith effort to ensure our users are provided accurate information when using our services or purchasing our products. However, some information found on this website may contain some limited inaccuracies or typographical errors. This is due primarily to factors, which are beyond our control. It is for this reason CCX along with our affiliated companies or partners are not responsible for errors or omissions. In addition, you understand that, except for information, products or services clearly identified as being supplied by CCX, CCX makes no representations about the suitability of the information, products or services contained on this website for any purpose. CCX and our affiliates disclaim all warranties and conditions regarding this information, the products and/or services, including all implied warranties and conditions of merchantability and fitness for a particular purpose with respect to the service or any materials and products. Under no circumstances shall CCX, the CCX affiliates, or its suppliers be liable for any direct, indirect, incidental, punitive, or consequential damages of any kind whatsoever (including, but not limited to, loss of business, revenue, profits, use, data or other economic advantage) however it arises, whether in breach or in tort, or related to any information contained herein. You agree to hold CCX harmless from, and you covenant not to sue CCX for any claims based on using this website. This agreement may be terminated by either party without notice at any time for any reason. The provisions of paragraphs 1 (General Information), 2 (Copyright Notice and Trademarks), 3 (Use of Information), 4 (Disclaimers and Third party Links), 5 (Indemnity), and 7 (Governing Law) shall survive any termination of this agreement. The construction and interpretation of this agreement shall at all times and in all respects be governed by the laws of the State of South Carolina. bypass measures used to prevent or restrict access to CaboodleZ.com. Please contact CaboodleZ.com about any problem or offensive content so that together we can keep the site working properly. We reserve the right to limit or terminate service, remove content and take technical and legal steps to keep users off CaboodleZ.com if we think that they are creating problems or acting inappropriately with respect to our policies. However, whether we decide to take any of these steps, remove content or keep a user off CaboodleZ.com or not, we do not accept any liability for monitoring CaboodleZ.com or for unauthorized or unlawful content on CaboodleZ.com or use of CaboodleZ.com by users. CaboodleZ.com is a fee based listing service. 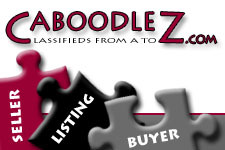 We charge a fee for each listing you place on CaboodleZ.com. Our fees are quoted in US Dollars, and we reserve the right to change them from time to time. We'll notify you of changes to our fee policy by posting such changes on the site. Our fees are non-refundable, and you are responsible for paying them when they're due. If you don't, we may limit your ability to use our service. If your payment method fails or your account is past due, we may collect fees owed using other collection mechanisms. CaboodleZ.com contains stuff from us, you, and other users. You agree not to copy, modify, or distribute CaboodleZ.com, our copyrights or trademarks. When you give us content, you are granting us a non-exclusive, worldwide, perpetual, irrevocable, royalty-free, sub-licensable right to exercise the copyright, publicity, and database rights to that content. (We need these rights to host and display your content.) If you believe that your rights have been violated, please notify our designated copyright agent at CaboodleZ.com Customer Support and we will investigate the matter. We reserve the right to remove content where we have grounds for suspecting the violation of these terms or of any party's rights. Do not post content that infringes the rights of third parties. This includes, but is not limited to content that infringes on intellectual property rights such as copyright and trademark (e.g. offering counterfeit items for sale). We reserve the right to remove content where we have grounds for suspecting the violation of these terms, our policies or of any party's rights. The following steps are for reporting a listing to CaboodleZ.com that you believe to be infringing on your intellectual property rights. Only the intellectual property rights owner can report of potentially infringing items or listings on CaboodleZ.com. If you have a good faith belief that a listing on CaboodleZ.com infringes your copyright, trademark, or other intellectual property rights contact CaboodleZ.com. You agree not to hold us responsible for things other users post or do. As most of the stuff on CaboodleZ.com comes from other users, we do not guarantee the accuracy of postings or user communications or the quality, safety, or legality of what's offered. We also cannot guarantee continuous or secure access to our services. Accordingly, to the extent legally permitted we expressly disclaim all warranties, representations and conditions, express or implied, including those of quality, merchantability, merchantable quality, durability, fitness for a particular purpose and those arising by statute. We are not liable for any loss, whether of money (including profit), goodwill, or reputation, or any special, indirect, or consequential damages arising out of your use of CaboodleZ.com, even if you advise us or we could reasonably foresee the possibility of any such damage occurring. Some jurisdictions do not allow the disclaimer of warranties or exclusion of damages, so such disclaimers and exclusions may not apply to you. By using CaboodleZ.com, you agree to the collection, transfer, storage and use of your personal information by CCX on servers located in the United States. We may update this agreement at any time, with updates taking effect when you next use the site or after 30 days, whichever is sooner. No other amendment to this agreement will be effective unless made in writing, signed by users and by us. Send questions, comments or complaints to CaboodleZ.com Customer Support.